Dental implants restore the look and function of natural teeth without the prospect of decay. Failure to adhere to a twice-daily schedule of oral hygiene, however, can lead patients with implants to develop peri-implantitis, the equivalent of periodontal disease. Its symptoms include redness, inflammation, receding gum tissue, loss of dental bone, and other compromises to oral health that can threaten implant retention. Immediately after implant surgery, home care must focus on support for proper healing. The routine may include several days of clear liquids and soft foods, along with prescribed antibiotics and pain medicines. Twice-daily brushing should use an extra-soft manual toothbrush and avoid contact with the implant incision. Some patients may need to use post-surgical mouth rinses, either anti-bacterial prescriptions or mixtures of salt and warm water. Towel-wrapped ice packs help reduce swelling during the 24 hours after surgery, followed by warm compresses once the first day has passed. Sleeping sitting up or with extra pillows elevates the head and helps swelling subside. Biting down on a gauze pack for 30 minutes can control residual bleeding. Tobacco and alcohol use interfere with the body’s circulation and natural healing processes. Both should be avoided, along with vigorous exercise and any routine that involves physical exertion. Some of the techniques and dental products that take good care of natural teeth don’t work well with implants. Fluoride fights off tooth decay and keeps natural dental enamel in good shape. On implants, however, fluoride can yield corrosion, roughness, and etching. Whitening and stain-removal toothpastes use baking soda and abrasives that can scratch implants. To clean implant-supported removable prostheses, patients should use products designed for dentures. Studies show that soft-bristled manual and electric toothbrushes—both rotating and sonic models—clean implants effectively, provided that each patient uses the type of brush best suited to his or her mouth and dexterity. Interdental brushes use plastic-coated wire to remove plaque from areas that are difficult to reach with other tools. Patients should clean implant-supported removable dentures or bridgework outside the mouth with denture brushes. Flossing techniques for implant fixtures that support fixed multi-tooth bridges or dentures differ from the methods used on single-tooth implants or natural teeth. Floss manufacturers offer products designed specifically for use with implants. Uncoated dental tape also does a good job of protecting gum tissue around implant fixtures. A threader helps insert floss under implant-supported fixed dentures and bridges. To clean exposed implant hardware, an interdental brush improves on floss, avoiding the risk of leaving behind bits of material that can prompt inflammation. An oral irrigator helps control plaque and inflammation around implants, especially in areas of the mouth where access is limited. These devices offer extra assistance in cleaning around fixed and removable implant-supported prostheses. Rubber-tipped and bristled oral stimulation devices help promote a healthy gum-tissue seal around implants. These devices can be especially important to patients with implant-supported dentures and bridgework. These brushing aids add a brightly colored temporary stain where plaque accumulates. They help patients evaluate their home care and identify areas that require more or better attention. Patients with dental implants require a regular schedule of professional dental care to maintain their oral health, including cleanings every three to six months and x-rays once a year. 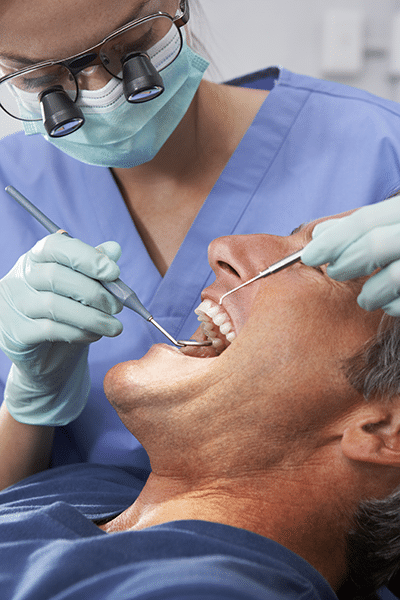 Gum tissue fibers don’t attach themselves to dental implants the way they do to natural teeth. To maintain gum health and prevent bacteria from creeping into the area around the implant crown, dental professionals use instruments made from materials that won’t scratch the implant. Instead of metal scalers and curettes, low-power ultrasonic cleaning devices and plastic or resin tools keep implants clean without damaging them. If implant hardware appears damaged or the fit of a removable prosthesis changes, it’s important to seek professional attention immediately.